Between the 12 and 14 March 2019, FXTM Research Analyst Lukman Otunuga completed a productive media tour in Lagos, Nigeria. Over the course of the tour, Lukman met with major tier 1 business and finance editors to share his invaluable expertise on financial market movements. On the 13 March, Lukman held a prestigious press conference, where he shared his market insights with major print outlets including The Guardian, The Daily Sun, ThisDay and the Nigerian Tribune. At this special event his expertise was also sought by radio stations Inspiration FM and Nigeria Info FM, and TV stations including Channels TV and CNBC Africa. Watch Lukman’s interview with Channels TV here. Read about Lukman’s thoughts on Nigeria’s economic potential here. Following the media tour, Lukman delivered two seminars on the 15 and 16 of March, which gathered a total of 230 traders from across the region and beyond. At these interactive events, many traders who had enjoyed Lukman’s interview with Channels TV had the chance to hear from the local market expert first-hand. Participants discovered insights into key topics including technical analysis, fundamental analysis and foreign exchange, and had the chance to ask their own trading questions to a renowned market authority. Lukman’s media tour and seminars in Lagos were a huge success, and a testament to FXTM’s special relationship with traders and media outlets in Nigeria. The tour takes FXTM one step further on its mission to deliver industry-leading market analysis to FX traders around the world. Keep your finger on the pulse of the markets by following FXTM’s Daily Market Analysis page. terus close account tu.. transfer masuk account baru pun sama... terkeno jugak! "I don't look to jump over seven-foot bars; I look around for one-foot bars that I can step over. 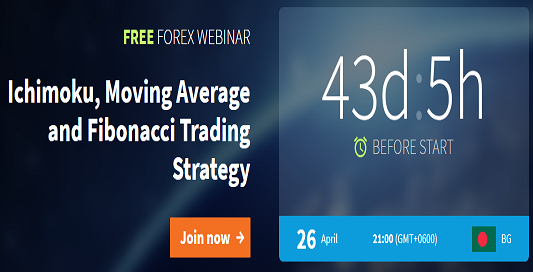 - Warren Buffett"
Last edited by cairol; Yesterday at 10:21 PM..
Join FXTM Forex Educator Robin Mazumder for an unmissable webinar on the Ichimoku, Moving Average and the Fibonacci Trading Strategy. This structured webinar, presented in Bengali, will teach participants a trading strategy combining two popular indicators. Perfectly demonstrated step-by-step, this session will teach you how to setup, attach and use these indicators, and – most importantly – how to combine them to identify the prevailing trends in the market from the comfort of your own home. Don’t miss out, sign up today! FXTM are thrilled to announce the launch of our biggest deposit bonus promotion ever – The Big $5,000!! We are offering an extra 30% back from every amount our traders deposit over a period of 30 days, up to a total of a huge $5,000! This fantastic promotion is available under Exinity Limited and is a great way for our new and seasoned clients alike to enjoy a superior trading experience with us. There is absolutely no limit to the number of deposits that can be made during the promotion period, meaning that traders have every opportunity to reach that $5K profit! Your first deposit must be a minimum of $300. All subsequent deposits need to be just $100 or over to get your bonus trading credit. The Big $5000 is available on the Standard Account on MT4, as well as the ECN Zero Account on both MT4 and MT5. Activating this fantastic promotion couldn’t be simpler. Just register with FXTM or log in to your MyFXTM account, read & accept the T&Cs and make your first deposit to start earning your 30% bonuses! If you aren’t trading with a global award-winning broker yet, there has never been a better time to start. - Access to industry-leading trading platforms, and more! Don’t miss out on the chance to be a part of this exclusive opportunity! For further information, feel free to contact our dedicated Customer Support Team. Trade your way to the Big $5K! Want to take part in more of FXTM’s amazing promotions and competitions? Join today!